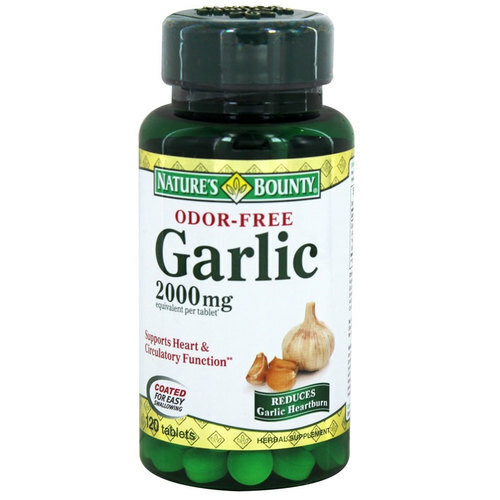 Nature's Bounty Odor-Free Garlic comes in easy to consume coated tablets. Warnings: If you're pregnant, nursing, taking any medications including blood thinners, planning any medical or surgical procedure, or have any medical condition, consult your doctor before use. Discontinue use and consult your doctor if any adverse reactions occur. Keep out of reach of children. Store at room temperature. Do not use if seal under cap is broken or missing. Notes: GMP Certified. Yeast Free. Dairy Free. gluten Free. Lactose Free. Soy Free. Sugar Free. Wheat Free. Fish Free. Shellfish Free. Artificial Sweeteners Free. Artificial Flavors Free. Recommended Use: For adults, take (1) tablet two to three times daily, preferably with meals. The customer reviews posted below are based on individual consumer experiences and may NOT necessarily represent what expected results will be from using or taking Nature's Bounty Garlic Odor-Less - 2,000 mg - 120 Tablets. These results may not be typical and you should not necessarily expect to receive the same results. Actual results may vary. Very good! I have felt much better after using these capsules. Those who have condition should use as it is an excellent bactericide and strengthens the immune system. I have seen reports of people who have had the regulated pressure with their use and others who were less susceptible to colds and flu. Excellent medicine for blood pressure. For high blood pressure, a great aid in fighting fat in the arteries, helping to lower high blood pressure, and maintaining a healthier life, and best without feeling that taste of garlic in the mouth, because the advanced formula of Nature's Bounty is Odorless .